Mold will grow on you—not in a good way. While familiarity can breed contentment in some areas, mold only will breed contempt and possibly health issues. That said, however, there are acceptable (translate “normal environmental”) mold levels of certain varieties. Much like bacteria, we will need to continue to co-exist with mold. Also like bacteria, there are some beneficial mold applications (e.g., penicillin antibiotic is derived from mold). 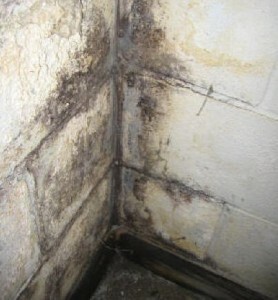 Example of Mold growing on basement cinderblock wall. Here’s the rub: It’s extremely difficult for the untrained eye to know whether mold is dangerous and/or has spread beyond “acceptable levels.” A major exception is the type of mold that appears on shower tiles. Generally, this is not harmful and can be relatively easily removed. Prevention is by far the best way to deal with mold threats according to Purofirst Repair Division Production Manager Hunter Pitts. For example, that’s why emergency crews will immediately cut away wet drywall and insulation—and dry everything out thoroughly. However, a key step in prevention is examination. It may be worth the relatively small investment to consider such preventive measures as examining accessible areas for any obvious signs of mold (e.g., crawl spaces and basements), as well as conducting periodic infrared inspections of such “invisible areas” as inside the walls. Bottom line: Be vigilant, observant and proactive when it comes to property mold—you’ll save money, lessen stress, and avoid unnecessary health hazards.